Blue Dragon Books in Glenbrook. Image by Jade Jackson. Being a tranquil destination, it's not surprising the Blue Mountains is home to a trail of secondhand bookshops. Sprawling at a lookout with a cup of tea, a freshly baked cookie and an unexpected book purchase is a perfect way to spend a relaxing weekend, away from the drudgery of work. Here's a list of the best ones. Note that listed genres are not exhaustive, you'll need to visit each store to see everything they stock. Blue Dragon Books has an excellent selection of plays, fantasy and science fiction, young adult, kids books and crime/horror/thriller. There's also a small section on Blue Mountains History. Books average $5 - $10. Shop C, 11 Ross Street, Glenbrook, PH: 02 4739 2466. Open Mon-Fri 9:30am to 5pm, Sat 9:30am to 3pm and Sun 10am to 2pm (but only on the 1st and 3rd Sunday of the month). Victory Theatre Antique Centre in Blackheath has little pockets of books. Image by Jade Jackson. Revolve Records takes over the Glenbrook Community Centre occasionally with collectibles, modern fiction, classics and comic books. Easter and June long weekends are the next fairs, but check their website. Glenbrook Community Hall Corner Ross St and Great Western Highway Glenbrook. PH: 1800 626 610. Open 9am - 5pm. Blaxland Vinnies doesn't have a huge selection, but they're cheap, with 5 books for $5 and if you're heading up the mountains, it's on the highway. Expect to find modern fiction, gardening, romance and biographies. St Vincent De Paul Society 132A Great Western Highway Blaxland. PH: 02 4739 8402. Open 9am to 4pm Mon to Fri, 9am to 2pm on Saturday. Closed Sunday. There's a second, larger shop at 272 Macquarie Rd Springwood, same hours. Brown Books in Springwood. Image by Jade Jackson. 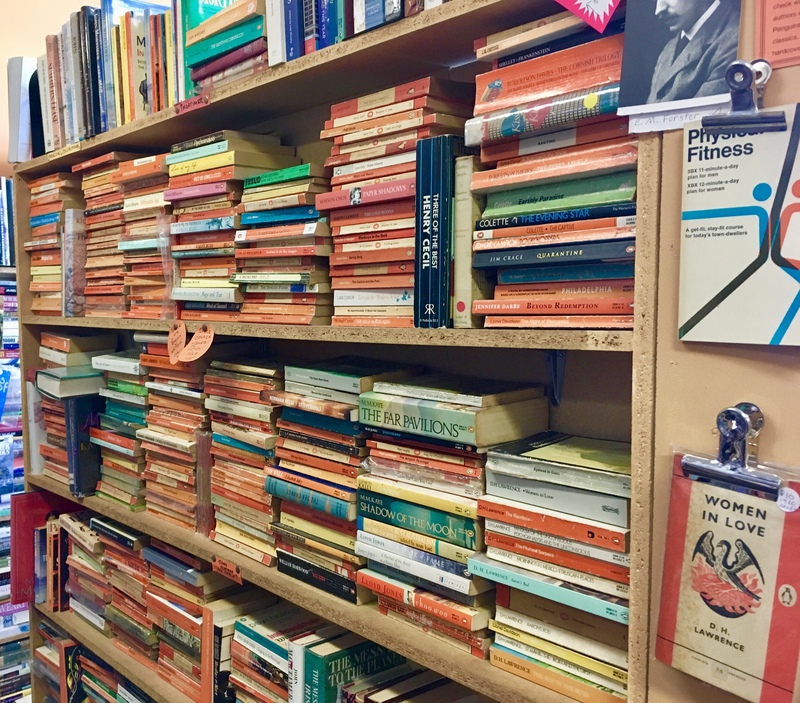 Brown Books is a maze of classics. 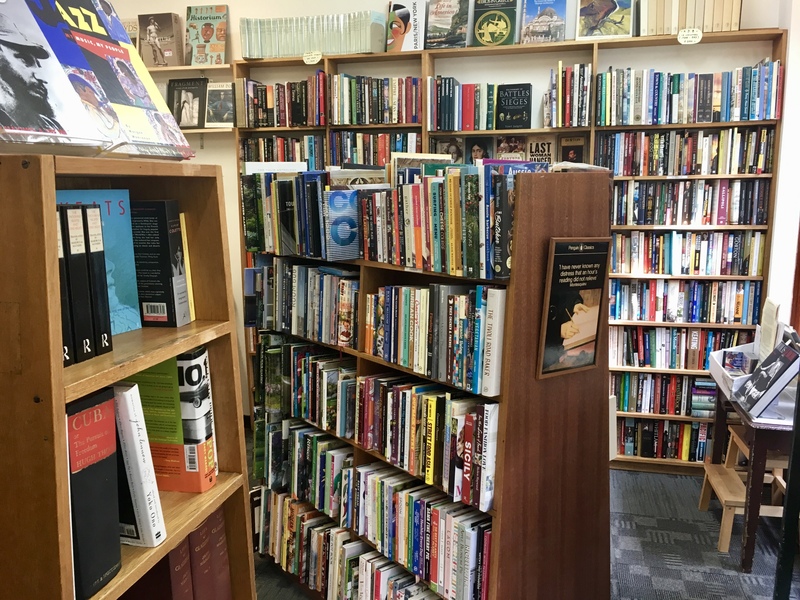 They're renowned for vintage books, and collectible literary titles, but stock everything in between from travel guides to maritime history, from sports to cookbooks, and fiction to fantasy. 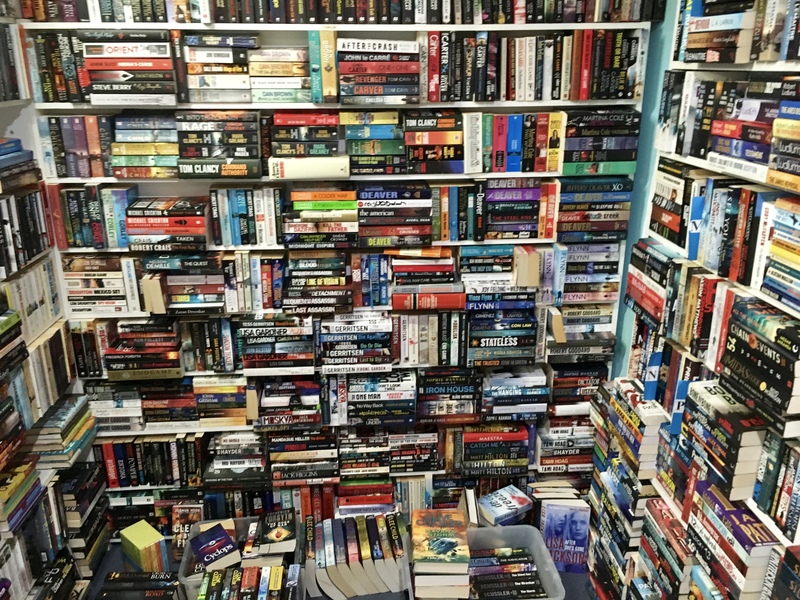 Prices range from $5 to $10 for paperbacks, and from $15 for vintage hardcover. The Turning Page is adjacent and sells new books. Grab a coffee from Cassiopeia, you'll be here a while. Shop 4, 125 Macquarie Rd Springwood. Open Mon to Fri 9:30am to 5pm, Saturday 9am to 3:30pm and Sunday 10:30am to 3pm. Lamdha Books sells a mixture of like-new, used, and rare antiquarian titles. They have a good selection of plays, modern classics, Australian fiction, music, and children's books. They also have foreign language fiction books. Grab a book and a pie and head to Wentworth Falls Lake. Shop 1, 32 Station St Wentworth Falls. PH: 02 4757 1420. Open 7 days from 9am to 5pm. Mr Pickwick's in Katoomba has to be the largest secondhand bookstore in the Blue Mountains. Image by Jade Jackson. Mr Pickwick's is an eclectic vintage store and their basement level is all books. 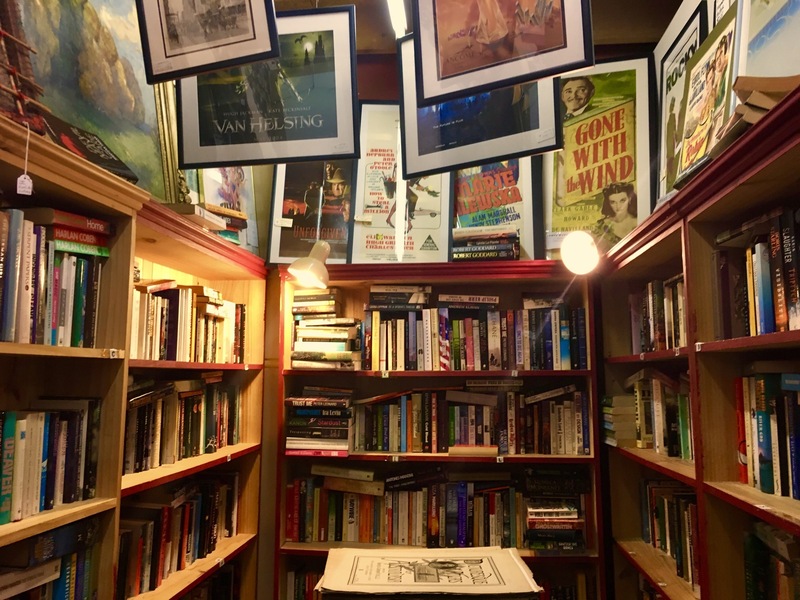 They have an extensive selection of specific genres like engineering, war, sports, Australian fiction, theatre, art, plays, travel guides and maps, alongside rare collectibles. Prices started from $8 for paperbacks and from $20 for hardcover art books. Once you've found a book, head to Aunty Jack's for afternoon tea and a chocolate crackle. 85 Katoomba St, Katoomba. PH: 02 4782 7598. Open 7 days from 10am to 6pm. Victory Theatre Antiques Centre offers hardcover thriller and mysteries, music and theatre, history and war, and kids books. You'll often find multiple books on a single topic from a private collection. 19-21 Govetts Leap Road, Blackheath PH: 02 4787 6002. Open 7 days 10am to 5pm. Gleebooks in Blackheath has two stores - new and secondhand. Image by Jade Jackson. Gleebooks in Blackheath has two stores. The street-front store is all new, and the other is all secondhand. It's small but has a decent choice of classic and modern fiction, history, art, Australiana and kids books. Prices start from $7. Govetts Leap lookout near here, is my favourite reading spot because there's no cell phone coverage! Collier's Arcade, 21-25 Govetts Leap Road, Blackheath. PH: 02 4787 6340. Open 7 days from 10am to 5pm. 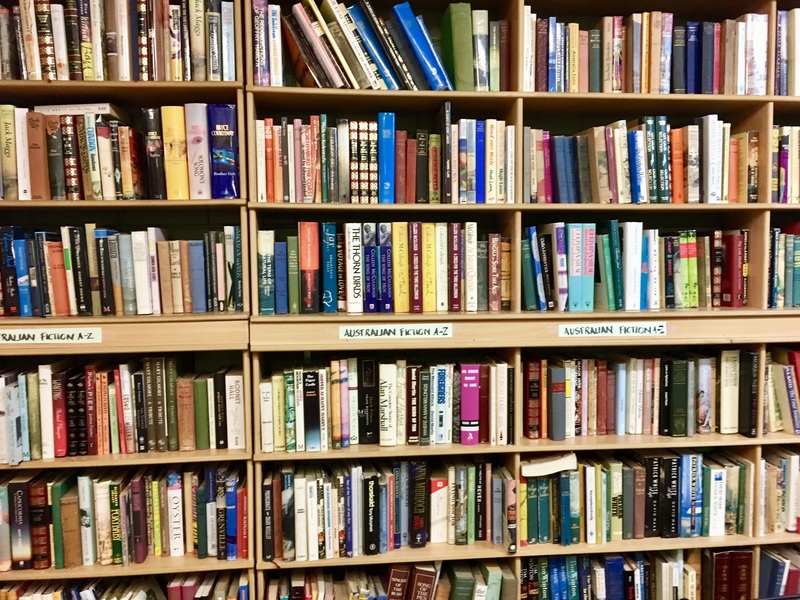 Blackheath Op Shop is a not-for-profit supporting community projects and offers an assortment of random books, with a few hidden treasures. There's also a huge kids section. Prices range from 50c to $2. 134 Station St Blackheath PH: 4787 5727. Open Tue to Sun 10:30 to 4:30pm. Cash only. Why? There’s a trail of secondhand bookshops throughout the Blue Mountains. When: Most open 7 days a week, check local times. Where: Various locations, check individual listings for details. Cost: Prices vary but start from 50c and average $5-$15 per book.